John Logan’s play RED was screened at cinemas across the country by MGC’s director Michael Grandage. It was artistic, fascinating and an interesting insight into the brain of Mark Rothko. Like all filmed productions of theatre shows, the live nature of the theatre can get in the way. The melodrama of a stage performance can be off-putting to a cinema audience, but RED doesn’t appear corny or overly dramatic. RED is an analysis or perhaps a critique of the famous painter Mark Rothko. It follows the story of Ken (Alfred Enoch), an assistant to Mark Rothko (Alfred Molina). Ken holds a wide knowledge of art and is interested in the new pop art; however, he clashes with Rothko who still holds the value of his own paintings close to his heart. Rothko believes that art should be made from suffering whereas Ken believes art can simply be for fun and entertainment. Together they learn from each other and tackle Rothko’s greatest work. The acting of both Molina and Enoch is surely award winning, each having a verbal battle with the other, fighting for power over the intellectual conversation. Both have long, riveting monologues about the value of art and the artist, all overshadowed by both of their own painful histories; Ken applying his tragic history in his own work. 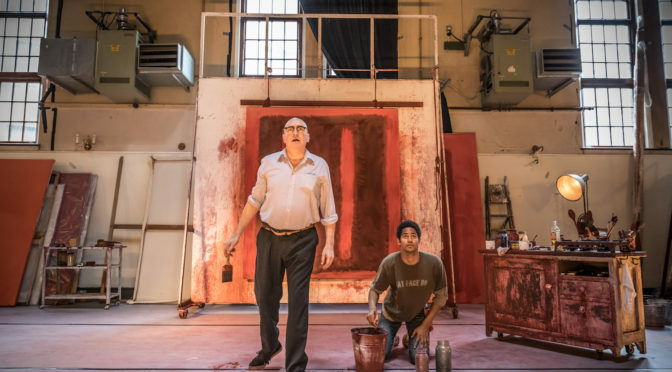 This play allows people to see that Rothko’s paintings were not just pretentious paintings of reds and blacks, but the product of a tortured existence. The set design by Christopher Oram clearly shows where a master painter would work, with numerous different artistic tools and canvases. The artistic choice to have the two cast members do their own scene change in character and in the light was a powerful one. You really do feel as if days, months, years go by as Ken continues to work for Rothko and build up their relationship, and you find yourself holding on to every word they say.